Al-Sadd Sports Club (Arabic: نادي السد الرياضي‎) is a Qatari sports club based in the Al Sadd district of the city of Doha. It is best known for its association football team, which competes in the top level of Qatari football, the Qatar Stars League. Locally, it is known primarily by the nickname "Al Zaeem", which translates to "The Boss". In addition to football, the club has teams for handball, basketball, volleyball, table tennis and athletics. It is the most successful sports club in the country, and holds a national record of 53 official football championships. The origin of Al Sadd's conception began with four Qatari students who excelled in football, but did not wish to join any of the existing football clubs. After consulting with the minister of Youth and Sports, the group, led by Abdulla bin Ahmed bin Mubarak Al Ali and Ali bin Mohammad bin Ali bin Sultan Al Ali, founded the club on 21 October 1969 in Qatar's capital city. Al Sadd was established by eleven high school students who excelled in playing football, with the oldest member being 17 years old. They refused to join other clubs at the time and decided to make their own club. Four of them consulted with Sheikh Qassem bin Hamad Al-Thani, who was the minister of Youth and Sports at the time. He obliged their request, resulting in the formation of Al Sadd Sports Club. Many of the early players and supporters were remnants of Al Ahrar SC, a club which was dissolved in the 1966/67 season. In their initial year of establishment, the father of one of the founders, Hamad bin Mubarak Al Attiyah, coached the club and the team trained on a football pitch in a local high school. Badr Bilal played for the club from 1979 to 1991. The club won the first ever league title in 1971–72. However, this was one year before the league was officially recognized. Thus, they won their first official QSL title in 1973–74. Sadd, along with Al Arabi and Al Rayyan, went on to dominate Qatari football in the 70s and the 80s by winning many Qatari League trophies and Emir Cups. Youssef Saad, a Sudanese forward who played for the club since its inception, was the first ever professional player to officially join the ranks of Al Sadd. In 1974, while Al Sadd was still in its infancy, they dubiously transferred 14 players, including Mubarak Anber and Hassan Mattar, and head coach Hassan Othman from Al Esteqlal (later to be known as Qatar SC), much to the dismay of club président Hamad bin Suhaim. Transfers could be made unconditionally during this time, meaning Esteqlal's protests were in vain. This was a major factor in them winning their first cup championship the next year in 1975. They defeated Al Ahli 4–3 in a tightly contested match under the leadership of Hassan Osman in order to claim the Emir Cup. Their goals came from Youssef Saad, who scored a brace, and Ali Bahzad and Abdulla Zaini. Till this day, it is the joint-largest score in an Emir Cup final match. They won the first ever Sheikh Jassim Cup held in 1977–78, as well as winning it two more times in the next two years. In 1978–79, the club succeeded in achieving their first domestic double by winning both, the Sheikh Jassim Cup and the league, accomplishing the same feat the next season. In the 1981–82, they won the Emir Cup and Sheikh Jassim Cup, once again under the reigns of Hassan Osman. During this period, Badr Bilal and Hassan Mattar, both of whom were top scorers in the league at one point, led the team to victories in both of the finals. Al Sadd also succeeded in setting an Emir Cup record by defeating Al Shamal 16–2, the largest recorded win in the history of the tournament. They nearly completed a domestic triple in 1987, but lost 2–0 to Al Ahli in the Emir Cup final that year. They were the first team to play against English side Cheadle Town on their home grounds, Park Road Stadium, under the leadership of Jimmy Meadows in 1982. They were victorious by a 4–1 margin. Al Sadd won their Champions League debut in 1988 (then known as Asian Club Championship), where they secured the top position in their group. They faced Al-Rasheed of Iraq in the final, defeating them on away goals, thus fending the Iraqis off in order to claim the title of the first Arab team to ever win the championship. The victorious team was largely made up locals, with the exception of Lebanese Wassef Soufi and Iranian Amir Ghalenoii, who did not participate in the final due to the Iran–Iraq War. In addition to winning the Asian Champions League, they won the Sheikh Jassim Cup and the league on that year. They were the first team to play in Iran after the Iran–Iraq War, losing 1–0 to Esteghlal in a ACC match in 1991. The 1990s were a lean phase for Al Sadd, regarding the league. They could not win even one league championship during that period. However, they did manage to open their account in the Heir Apparent Trophy and also won the Gulf Club Champions Cup in 1991. The new millennium opened up a new era for Al Sadd. They returned to winning ways in the Qatari League, won many Emir Cups and Heir Apparent trophies. They also managed a triple crown in regional football by winning the Arab Champions League in 2001. Fossati helped the club achieve a domestic quadruple. They recorded the largest-ever win in the Sheikh Jassim Cup in 2006, when they defeated Muaither 21–0. In 2007, under the command of Uruguayan coach Jorge Fossati, they achieved a quadruple by winning all four domestic cups. They were the first Qatari team to do so, and had also set a league record for the highest winning streak by winning 10 leagues games in a row. In addition, they made a record signing in Qatari football by paying $22 million for the Argentinian Mauro Zárate the same year. In 2010, they were the second team to ever win the QNB Cup by defeating Umm Salal in the final. Al Sadd was placed in the qualifying play-offs of the 2011 Champions League, courtesy of the disqualification of Vietnamese teams due to the non-submission of documents. They beat Al-Ittihad of Syria and Indian club, Dempo SC, 5–1 and 2–0 respectively, to acquire a spot in the group stage. Al Sadd, who were the definite underdogs, overcame the odds and topped their group to play against Al-Shabab, whom they beat 1–0. The quarter-final against Sepahan would mark the first sign of controversy for the club. Sepahan had initially won the first-leg match against Al Sadd 1–0; however, after the match, Al Sadd lodged a formal complaint to the AFC as Sepahan had fielded an ineligible player, Rahman Ahmadi, who previously received two yellow cards in the tournament with his former club. The match was overturned 3–0 in favor of Al Sadd, virtually ensuring the club a place in the semi-finals. They later faced Suwon Samsung Bluewings in a highly publicized semi-final. Suwon were favorites to win after knocking last year's runners-up, Zob Ahan, out of the running. The first-leg match was played in Suwon, South Korea. In the 70th minute of the match, Mamadou Niang of Al Sadd had a deflected shot veer past the goalkeeper, settling the score 1–0. Ten minutes later, a Suwon player was inadvertently kicked in the head by an Al Sadd défender, prompting Suwon to kick the ball out of play. While the injured Suwon player was being tended to, Niang sprinted past the keeper to score a second goal, infuriating the Suwon players. The chaos was elevated when a Suwon fan had run onto the pitch, sparking a mass melee which involved both coaching staff and players. After the fight was brought to a halt, the referee sent off a player from each team while Niang later got a red card and Al Sadd's Korean defender Lee Jung-soo had walked off the pitch in frustration. The melee prompted official investigation from the AFC, who suspended three players from both teams for six games. Al Sadd lost the second leg 1–0, though this allowed them to advance to the final with a 2–1 aggregate to face Jeonbuk Hyundai Motors. Al Sadd later received the nickname "Al-Badd" from the Korean media as a result of their semi-final confrontations. They won the 2011 AFC Champions League Final against Jeonbuk, 4–2 on penalties. This earned them a spot in the 2011 FIFA Club World Cup. To date, this is the best result achieved by a Qatari team in the AFC Champions League under its new format. Al Sadd also became the first team to reach the AFC Champions League knockout stage after starting their campaign in the play-offs in February. Furthermore, Al Sadd was crowned "AFC Club of the Year" in 2011 by AFC after their Champions League conquest.Championship 2011 in honor of the club's owner changed the team logo and stars to commemorate the AFC Champions League 1988.2011 was etched on the shirt Wolves. During the 2011 FIFA Club World Cup, Al Sadd were eliminated in the semi-final stage by Barcelona, which set up a third-place meeting between them and Kashiwa Reysol. This was the first time two clubs from the same confederation faced off each other in a third-place match. Al Sadd won the encounter on penalties in order to be the first West Asian club to claim the bronze medal in the FIFA Club World Cup. After the departure of Fossati, former Al-Sadd midfielder Hussein Amotta was named as the new coach in May 2012. The Moroccan had finished as the Qatar League top scorer during his four-year stay at the club from 1997–2001. He was working as the club's technical director prior to being promoted to the top job. Just days before Amouta's appointment, Al-Sadd announced the high-profile signing of former Real Madrid captain Raúl, who arrived on a free transfer from Schalke 04. Managed by Amouta and led by new captain Raúl, Al Sadd set a league record for the best start to the league season ever by winning all of their first nine games, shattering the previous record set by Al Gharafa, who had won seven. The team went on to break Lekhwiya's two-year dominance by winning the 2012–13 Qatar Stars League title, five years after their last triumph in the competition. Al-Sadd faltered in the next two seasons, however, finishing third and second in 2013–14 and 2014–15 respectively, as Lekhwiya returned to win back-to-back titles once again. In 2015, Al-Sadd achieved the coup of signing Barcelona's storied Spanish international Xavi. Home matches are played in the state-of-the-art (football-specific) 48,000 seat Khalifa International Stadium. The club formerly played at Jassim Bin Hamad Stadium (also known as Al Sadd Stadium), with a capacity which adds up to 18,000, including VIP stands. The stadium, originally built in 1974, was renovated in 2004 for the Gulf Cup. Situated near central Doha, the venue attracts large numbers of spectators. It is the de facto home stadium of the Qatar national football team. Jassim Bin Hamad is a very distinct stadium in the Middle East because of its unique features, such as the cooling system which is implented. Among Al Sadd's most popular nicknames are Al Zaeem (The Boss) and Al Dheeb (The Wolf). From the foundation of the club, the common home kit includes a white shirt, black or white shorts, and white socks. White and black colours are also seen in the crest. The away kit of the club is associated with a black background. Pink was adopted as the club's primary colour for their third uniform in 2007. Their first crest was designed in Lebanon in 1969, and was similar to other football clubs in the region, in the sense that it depicted a football with Arabic writing on it. This crest was an hommage to former football club Al Ahrar. Originally, the club wanted to use the same crest as Al Ahrar, but this idea was rejected by the QFA. A second crest was designed in the eighties, and was designed by the founder of the club, Nasser bin Mubarak Al-Ali. It was used until 1999, the year in which their third crest was designed, also by Nasser bin Mubarak Al-Ali, in celebration of the 30-year anniversary of the founding of the club. Following their impressive AFC Champions League campaign in 2011, the logo was modified and released in June 2012 to include two golden stars on the top to mark the two Asian titles of 1989 and 2011. The club hosts numerous âge brackets with a number of youth coaches. Many notable local footballers have graduated from Al Sadd's academy, including Jafal Al Kuwari, Khalid Salman, Hassan Al Haidos and former Asian player of the year, Khalfan Ibrahim. There have been foreign graduates as well, such as UAE's Mutaz Abdulla. They have a youth development programme, which instills philosophies and enforces training ideals among the youth players. The programme had 284 participants enrolled as of 2011. Note 1: The first official Qatari League season was held in 1972–73. Note 2: Competition was not held that year. As of 26 April 2013. As of 13 September 2018. As of 4 April20179 the club holds 54 football championship titles. Reserve League titles are not included. As of 4 April 2019. Note: Early league statistics are primarily unknown. Players who are still active with the club are in bold. As of 18 July 2012. As of 8 February 2014. This list includes players whom have made significant contributions to their national team and to the club. At least 100 caps for either the national team or club is needed to be considered for inclusion. 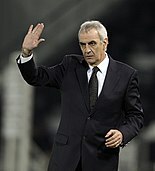 Jesualdo Ferreira, current coach of Al Sadd. Note 1 denotes player–manager role. Note 2 denotes caretaker role. À rivalry which stems from early in the history of the league, it is popularly known as the 'Qatari El Clasico'. This is the clash of Qatar's two most successful teams: Al Sadd and Al Arabi. For some fans, winning this derby is more noteworthy than winning the league itself. The derby is an important component of the country's culture. Al Arabi always regarded themselves as the club of Qatar's working class, in contrast with the more upper-class support base of Al Sadd. The social class divide between the two fan bases eventually diminished. 1995–96 0–0 Qatar Stars League Al Arabi crowned champions. 2005–06 2–1 Qatar Stars League Al Sadd crowned champions. 2009–10 3–3 Qatar Stars League Al Sadd come back from 3–0 down to deny Al Arabi an ACL spot. Historically, Al Sadd has been the favoured club of Qatar's upper-class. The club garnered many supporters in the early years of the Qatar Stars League, along with Al Rayyan and Al-Arabi, whom were the three main powers of the league. The new millennium saw an influx of new fans as a result of recruiting many foreign nationals to play for the club, as well as the club's performance in regional competitions. In order to better communicate with the fans, Al Sadd's fan club was established in the 2003–04 season of the QSL and was then an unprecedented idea in most Gulf and Arab clubs. The fan club serves many roles; it is not merely restricted to organizing fan groups within the stadium, but it is also used as a means to discuss ways in which to improve the club. In addition, annual general meetings are held between the management and fans in order to have an open platform to discuss issues in an open environment. This was greatly criticized at the beginning, while now other clubs are following suit. The club also has annual and monthly awards for the best players of the club which is sponsored by Givenchy. The fan club has won the QFA-sanctioned title of best fan club in Qatar for three successive years – 2006, 2007 and 2008. Furthermore, the fan club was also the first in Qatar to put the free SMS service for mobiles in place. This attracted more than 8000 subscribers who received a number of over 3 million SMS' during the first one and a half years. Also active on social networking sites, the club has official Facebook and Twitter accounts. ^1 Following the match between Al-Qadisiya and Al Sadd, Kuwaiti security personnel assaulted the visiting players; Al-Qadisiya were ejected from the competition and banned from AFC competitions for three years. Their record was expunged. ^2 The AFC Disciplinary Committee decided to award the quarter-final first leg to Al Sadd against Sepahan as a 3–0 forfeit win after Sepahan were found guilty of fielding an ineligible player. The match originally ended 1–0 to Sepahan. This is the current AFC coefficient. Rankings are calculated by the IFFHS. Al Sadd competing against F.C. Barcelona in the CWC. ^ "Official website Al Sadd Sports Club – Qatar". al-saddclub.com.com. Archived from the original on 26 June 2012. Retrieved 19 June 2012. ^ a b "Football Championships". al-saddclub.com. Archived from the original on 25 July 2015. Retrieved 14 August 2015. ^ a b c السد ..حكاية عمرها 44 سنة ..! الوالد على بن حمد العطية ورفاقه بدأوا بفكرة تحولت لصرح عملاق إنجازات وبطولات على مدار السنوات وضعت النادي زعيما للرياضة القطرية (in Arabic). goal.com. Retrieved 25 January 2014. ^ a b c مسابقة كأس سمو الأمير لكرة القدم المباريات النهائية (in Arabic). Al Kass. Archived from the original on 27 September 2013. Retrieved 25 April 2013. ^ "Park Road 'Opened' 30 Years Ago". pitchero.com. Archived from the original on 8 September 2013. Retrieved 8 September 2013. ^ a b عبيد جمعة: طفولتنا كانت صعبة لكنها حميمية ودافئة (in Arabic). Al Arab Newspaper. 21 January 2012. Retrieved 17 August 2012. ^ a b "الزعيم يواصل تحطيم الأرقام القياسية بدوري النجوم". Al Kass. 24 November 2012. Retrieved 24 November 2012. ^ "Dempo go down 0–2 against Al Sadd in AFC Champions League play-off". Times of India. 19 February 2010. ^ "Sepahan stripped of vital Asian win". FIFA. 26 September 2011. ^ "Al Sadd claim honours in fiery clash". ESPN. 19 October 2011. ^ "AFC acts after Suwon, Al Sadd brawl". ESPN. 25 October 2011. ^ John Duerden (8 December 2014). "How the bad boy of Asian football Nasser Al Shamrani has added intrigue to the 2015 Asian Cup". Yahoo! News Maktoob. Retrieved 16 July 2015. ^ "History for Qatar as Al Sadd win Asian title in dramatic shootout". CNN. 5 November 2011. Retrieved 3 November 2011. ^ "Underdogs Al Sadd crowned Asian champions". Aljazeera.com. 5 November 2011. Retrieved 3 November 2011. ^ "Bad boys raise Asian profile". soccernet. 14 November 2011. ^ "AFC Club of the Year: Al Sadd". AFC. 23 November 2011. Archived from the original on 3 February 2013. ^ "Al-Sadd take third place penalties". FIFA. 18 December 2011. ^ "Amouta named new Al Sadd coach". dohastadiumplusqatar.com. 1 June 2012. Archived from the original on 8 December 2015. Retrieved 29 November 2015. ^ "Official: Al Sadd announce signing of Raul". Goal.com. 12 May 2012. Retrieved 29 November 2015. ^ "Al Sadd claim Qatar Stars League crown in style". gulf-times.com. 13 April 2013. Retrieved 13 April 2013. ^ "Reports: Barcelona's Xavi Hernandez to sign 3-year deal with Al Sadd". ESPN. 26 March 2015. Retrieved 23 August 2018. ^ "Jassim Bin Hamad Stadium". worldfootballtravel.com. Retrieved 3 May 2013. ^ "Qatar and Iran in goalless draw". Gulf Times. 11 January 2008. Archived from the original on 7 June 2011. Retrieved 2008-08-25. ^ "Al Sadd, the kings of Qatar". FIFA. 16 December 2010. Archived from the original on 11 November 2012. Retrieved 7 February 2011. ^ نادي السد يلبس اللون الوردي (in Arabic). al3nabi.com. Archived from the original on 16 January 2013. Retrieved 25 August 2012. ^ a b "History". Al Sadd Club. Retrieved 16 September 2018. ^ الهلال والسد يمضيان على اتفاقية التعاون المشترك وتأصيل التآخي بين الاشقاء في الخليج (in Arabic). alriyadh.com. Retrieved 28 January 2014. ^ اتفاقية توأمة بين الزمالك والسد القطري (in Arabic). al-mashhad.com. Archived from the original on 1 February 2012. Retrieved 28 January 2014. ^ توأمة بين الهلال السودانى والسد القطرى (in Arabic). kora.com. Archived from the original on 28 January 2014. Retrieved 28 January 2014. ^ "ar:" برعاية السد " شالكه يواجه أياكس يوم 10 يناير في قطر" (in Arabic). alkass.net. Retrieved 5 January 2015. ^ "Al Sadd SC Signs Cooperation Agreement with Turkey's Trabzonspor". Qatar News Agency. 10 September 2017. Retrieved 16 September 2018. ^ "Heir Apparent Cup finals" (in Arabic). Al Kass. Retrieved 25 April 2013. ^ أسماء الجهاز الإداري والطبي لقطاع الفئات السنية (in Arabic). al-saddclub.com. Archived from the original on 6 January 2014. Retrieved 12 September 2012. ^ أسماء الجهاز الفني لقطاع الفئات السنية (in Arabic). al-saddclub.com. Archived from the original on 16 January 2013. Retrieved 12 September 2012. ^ "الصفحة 12 (8-11-1995)". charlesayoub.com. 11 August 1995. Archived from the original on 17 December 2014. Retrieved 17 December 2014. ^ "الصفحة 12(12-8- 1996)". charlesayoub.com. 12 August 1996. Archived from the original on 13 December 2014. Retrieved 17 December 2014. ^ "الصفحة 13 (18-02-1997)". charlesayoub.com. 18 February 1997. Archived from the original on 13 December 2014. Retrieved 17 December 2014. ^ "Raul ready for first 'El Clasico' in Doha, urges Al Sadd's players to keep fighting". thepeninsulaqatar.com. 2 November 2012. Archived from the original on 30 June 2013. Retrieved 6 May 2013. ^ "رئيسية البطولات / جميع لقاءات الفريقين : الريان X السد" (in Arabic). superkoora.com. Retrieved 6 January 2014. ^ a b c "Al Sadd vs Al Arabi". QFA. Archived from the original on 6 July 2011. ^ a b c "Fans club". Al Sadd. Archived from the original on 26 February 2015. Retrieved 4 March 2015. ^ "تقرير تاريخي عن فريق السد – قطر". superkoora.com. Retrieved 28 May 2014. ^ "AFC Disciplinary Committee sanctions Sepahan". AFC. 26 September 2011. Archived from the original on 3 February 2013. ^ "TOP 400 Club World Ranking". IFFHS. 30 January 2012. Wikimedia Commons has media related to Sadd Sports Club.